Simple Fish Fry Marinated WithTamarind Pulp | Simple and Delicious ! This is the first dish which brought some applause after I started cooking.. :) I was zero in cooking when I prepared this.I had prepared few dishes like semiya payasam, vegetable cutlet, omelet and mango pachadi. Since my umma was with me I had nothing to worry with her help. But after marriage I tried to learn from many people who cook well. And this one I prepared my self using the remaining tamarind pulp which is used for preparing fish curry. 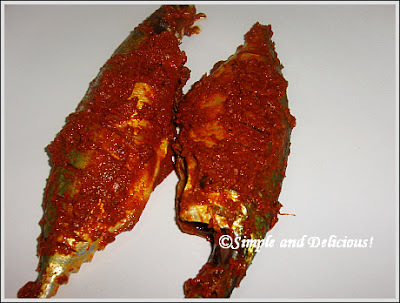 This simple masala is great for frying ayala / mackerel and mathi / chala / sardines. Grind shallots / chuvannulli and fennel seeds together. Mix with the powders and salt. Marinate fish in this.Do shallow fry. Seena, fish fry looks delicious!!! fish fry anytime for me... especially ayala and mathi.looks yum !! hey seena...ur fish fry looks delicious.I hope to make this sometime soon. Delhiyil irunnu ithu kandu ente vaayil vellam vannu. Thanks for the marinated fish fry. Last summer I ate them at a party and has been looking for an authentic recipe ever since. Now I will be able to make them myself. Thanks again.